This flagship product rapidly and effortlessly removes algae on glass and acrylic tanks from 50 to 200 Gal. Four rare-earth magnets provide an extra stable and super strong magnetic interaction across acrylic up to 1/2" thick and glass up to 5/8" thick. Magnavore-VI is recommended for tanks between 150 and 300 Gal. Safe and efficient in fresh water and marine, on acrylic tanks up to 3/4" thick and glass tanks up to 7/8" thick. Each replacement kit contains two base pads and soft touch pads precut to fit Magnavore-8 & 10 Cleaning Magnets. The base pads provide extra large 4.0 by 2.75 inch cleaning surface to rapidly remove even old stubborn algae from glass aquariums. Made from medical grade Velcro brand materials which feature non-toxic fish and invertebrate safe adhesive these base pads also serve as attachment surface for acrylic safe Acrylicare Pads. Twelve pads precut to the size of Magnavore 2ER, 4ER, 6,ER, 8 & 10 Algae Cleaner. 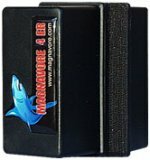 A Soft-Touch pad for the external magnet is included FREE in every box. Magnavore Acrylicare Brush attaches to internal magnet of the ER series Magnetic Algae Cleaners and make algae cleaning a bliss. To use Magnavore brushes, a brush-compatible internal magnet half with side locks is required. Older ER series can be retrofitted with a new internal half. For use with Magnavore 2ER, 4ER & 6ER Algae Cleaners on acrylic aquariumsTo assemble, push internal half through the center of the brush until the brush locks into position. You will hear a positive click. Make sure that all four tabs on the brush are securely locked.When cleaning acrylic tanks an Acrylicare Pad should be used over the base Velcro brand pad at all times with the sponge-like side facing up.Clean tank with slow even motions. If magnet does not track smoothly, lubricate the outside tank surface by spraying with distilled water or acrylic cleaner. Stay away from the gravel line. Any gravel or other debris caught between the pad and tank wall will result in scratching.To disassemble, gently spread pair of opposite tabs and push the internal half slightly down. Repeat with the other side. Be careful not to spread the tabs too aggressively as that may break them.Do not forget to replace the worn out pads regularly to maintain cleaning effectiveness at its peak. You will achieve best performance by cleaning the tank every other day.Replace brush when bristles get worn out and with a fresh Acrylicare Pad no longer touch acrylic panel. Spare rough surface for the inside magnets: 220.53, 220.54, 220.55,220.56Suitable for quartz glass panes. On outside, to be used for 220.53, 220.54. Glass thicknesses: 15 - max. 40 mm(.59 - max. 1.57 in.). Cleaning surface: 59 x 77 mm (2.3 x 3.0 in. ).With felt for acrylic panes.Height: inside 18 mm (.70 in. ), outside 22 mm (.47 in.). This soft fleece is an add-on for the rough surface of the inside magnets: 220.53, 220.54, 220.55,220.56. Aquariums with acrylic panes can be cleaned gently with this fleece.Order two units for magnet 220.57. Glass thicknesses: 35 - max. 55 mm(1.3 - max. 2.1 in. ).Cleaning surface: 115 x 77 mm (4.5 x 3.0 in. ).With felt for acrylic panes. Height: inside 26 mm (1.02 in. ), outside 27 mm (1.06 in.). To be used for 220.57. Two Little Fishies' NanoMag is an itsy-bitsy, lean, high-energy, window-cleaning apparatus. Its patent-pending design provides flexibility and a slender profile that slips safely between polyps and viewing windows. Its got the umph needed for cleaning glass up to 3/8 thick. The NanoMag also glides across the curved surfaces of fish bowls, wiping off algal films with ease, and its so much fun to use you just might have to take turns. 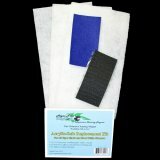 Algae cleaning sleeves for acrylic tanks. Width 45mm (1.77in. ), length 78mm (3in.). Glass thickness from 10mm (3/8") to max. 15mm (1/2"). Width 86mm (3.4in. ), length 140mm (5.5in.). Glass thickness from 15mm (1/2") to max. 20mm (3/4"). Width 86mm (3.4 in. ), length 140mm (5.5 in. ).Including a stainless steel blade and two spare plastic blades. This is a 2-pack of Stainless Steel Replacement (Glass Aquariums Only) blades for Algae Free Float Plus Cleaners. 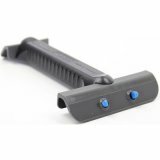 *Blades are made of high quality 316 stainless steel which is highly corrosion resistant but we still suggest removing from the aquarium when not in use. 1. Remove old blade by grabbing the plastic piece in the center with your thumb and index finger and push down on the blade with thumb. 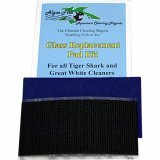 This is a 3-pack of Acrylic Replacement blades for Algae Free Float Plus Cleaners. for 3 (.12 in.) up to a glass thickness of 6 mm (.24 in. ), width 40 mm (1.57 in. ), length 81 mm (3.19 in.). Inside part 20 mm (.79 in. ), outer part 17 mm (.67 in.). for 20 mm (.79 in.) up to a glass thickness of 25 mm (.98 in. ), width 86 mm (3.39 in. ), length 140 mm (5.51 in. ).Including a stainless steel blade and two spare plastic blades.